In addition to choosing your data source in Tableau, you need to decide whether you want to use live or static data. In other words, do you want your analysis and visualizations to be based on the most current data that’s available or do you want to use an extract that provides a snapshot of the results based on criteria that you select? You might, for example, want to show the results for a specific, limited time frame such as last year or the previous quarter. If your analysis needs to show what’s happening right now, you’d want to use a live data connection that will be reflected in your views. 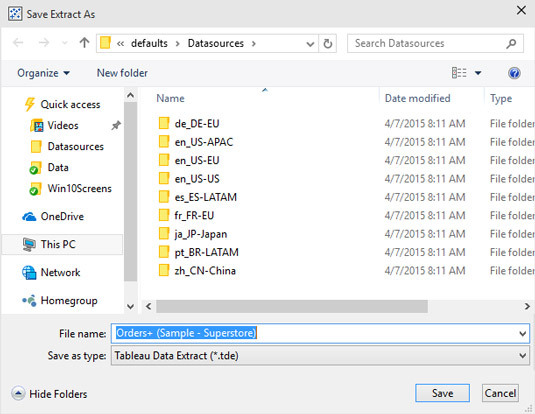 Check out Tableau’s Data Source page with the Extract option selected for the data connection. (This option enables you to import any data you may have stored as a Tableau data extract). 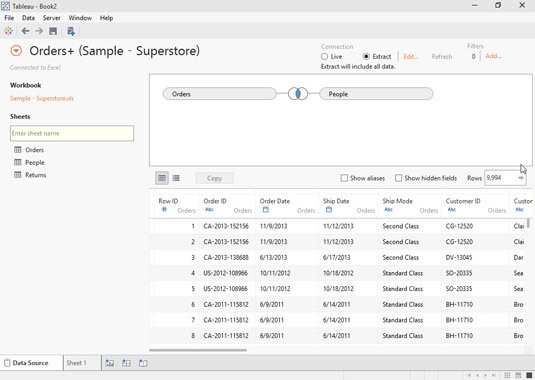 Because no filters have yet been specified, Tableau will use all the information in the current data source, but won’t automatically update any data analysis or visualizations when the information in that data source changes. Switching from Live to Extract means that you will be working with a snapshot of your data. There are a number of other reasons that you may choose to use a data extract. The most common one is portability. Let’s say that your data resides on a database server like MS SQL Server, but you want to do your analysis while you are on a plane or present your results in a boardroom, where you may not have a live connection to the data. Using a data extract will provide you with the data you need without the hassles of the connection. If you have Tableau Server, the Extract option can be set to a refresh schedule to be updated when needed. Suppose, however, that you’d like to limit your analysis and visualizations to a subset of the data contained in the data source. You can do so by applying a filter based on the contents of any field in your data source. For this example, imagine that you want to show what happened in a particular year. In the Data Connection workspace, select the Extract option under the Connection heading. Click the Edit link (just to the right of the Extract radio button) to display the Extract Data dialog box. 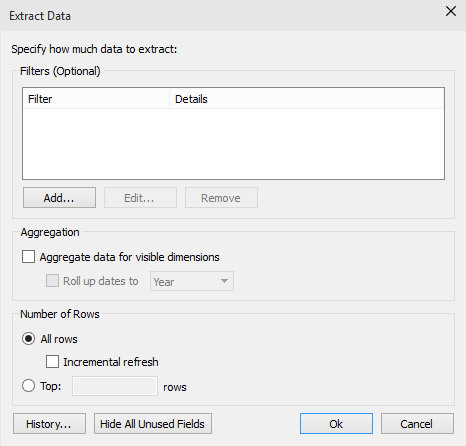 Use the Extract Data dialog box to limit the amount of data that’s used. 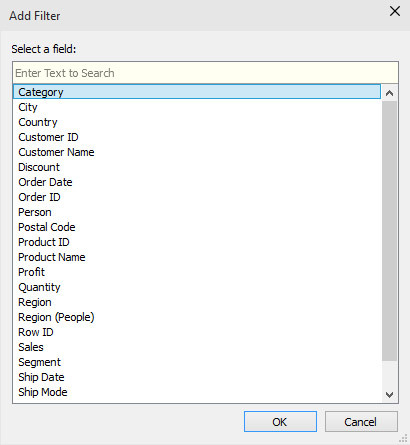 In the Extract Data dialog box, click the Add button to display the Add Filter dialog box. Choose the field for filtering. 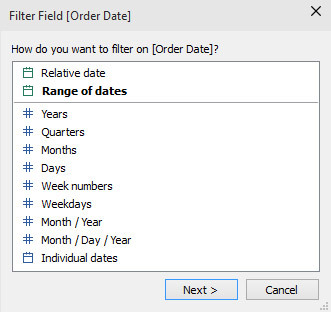 In the Add Filter dialog box, click the Order Date field and then click the OK button to display the Filter Field [Order Date] dialog box. Choose the level of filtering. Because you want to show the orders for a specific year, choose Years and then click Next. Doing so brings up the Filter [Year of Order Date] dialog box. 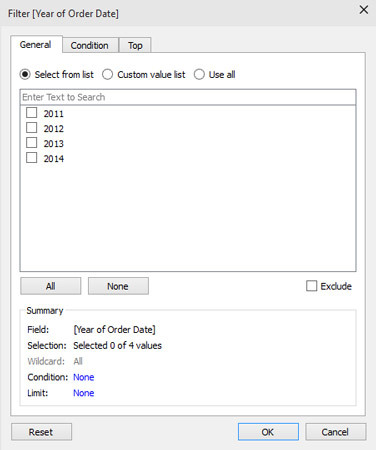 In this case, you want to base your analysis on orders from 2014, so select the 2014 check box and click OK to return to the Extract Data dialog box. You can now see the details of how the filter would be applied. Click OK to return to the Data Connection workspace. To create the extract, click one of the sheet tabs to display the Save Extract As dialog box. You need to save the data extract before you can use it. You have to save your extract before you can use it. Click the Save button to save the data extract. After you’ve saved the data extract, only the filtered data is used in your data analysis and visualizations. In this case, the results will only include data where orders were placed in 2014.